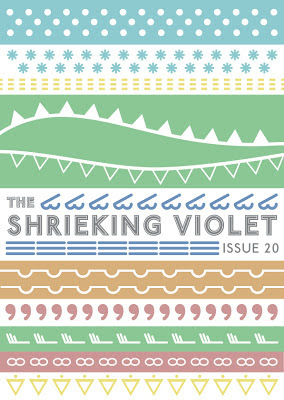 After a hiatus of six months or so whilst life got in the way, the Shrieking Violet has finally reached issue 20. Issue 20's cover is by Manchester-based freelance illustrator and designer Catherine Chialton. Her work is generally inspired by science, nature and food, and is split between using ink and vectors. Continuing Catherine's normal linear and patterned aesthetic, this piece was inspired by the usually grim Manchester weather, but with a brighter finish to it. Manchester-based filmmaker Richard Howe continues his series on mental health in the movies by looking at Betty Blue, which he fell in love with at the tender age of nine. Check out Richard's films at https://vimeo.com/18599252, www.youtube.com/watch?v=hhye0hzz72Q and www.youtube.com/watch?v=Qj6H_eCz_4s and tweet Richard about films @rikurichard. Artist, writer and arts administrator Jack Welsh has contributed an article about old and new public artworks by Eduardo Paolozzi and Daniel Buren in Tottenham Court Road tube station, London, which has been undergoing extensive renovation. Jack is based in Liverpool, but frequently works in Manchester. He recently completed a Masters in Arts Management, Policy and Practice at the University of Manchester. His dissertation, examining how the Art on the Underground programme contributes to the economic development of London, is part of a longstanding research interest in the role of art and design in underground transport networks. Joe Austin writes in praise of twentieth century artist Frank Dobson, sometimes referred to as the first truly British Modern sculptor. His interest was sparked by the discovery of a sculpture by Dobson in his local park. Joe is a qualified architect, originally from the Midlands but a naturalised Londoner for the last 23 years or so. Joe's interests are wide (his blog best illustrates his scattergun mind), but generally revolve around writing, design, architecture, art, culture and history. He likes nothing better than learning new aspects of things he thought he knew about. Midlands-based writer, musician and occasional wrestler JT Wilson has written about the Mystery Castle, a folly in the Arizona desert. JT first heard about the Mystery Castle while researching his forthcoming novel (about cryptozoology, love and other animals). He shares the hero's fondness for grandiloquent gestures, but not his architectural talent. Say hello to JT @jt_stories. Sam Lewis, a London-based musician, and occasional music writer, interviewed Michael Azzerad, author of Our Band Could be Your Life, as part of his Master's dissertation on how technology affects music. Listen to Being There at http://beingthere.bandcamp.com. Freelance illustrator Fuchsia MacAree has contributed two drawings, one of Queen Victoria and her border collie, and one repeat pattern originally created for a fundraising Movember exhibition. After degrees in graphic design and illustration, she is now doing a year-long residency in Dublin. Rebecca Willmott has written a children's story about the January Blues, hoping this will become a longer story in time. Rebecca graduated from Manchester Metropolitan University in 2011, specialising in Children's Literature in her final year. The story shows how baking (in particular, gingerbread men) brings the two characters together whilst mourning a great loss. It is influenced by the Shrieking Violet and Rebecca's many culinary experiments. Rebecca also submitted a gingerbread man recipe for the Shrieking Violet's third issue. Richard Bilsborough, who has spent the past 14 years being told he should take up cookery, has contributed a recipe for pork, barley and apple stew. He is from Preston, plays guitar for a band called Fighting and has a very dull administrative job. 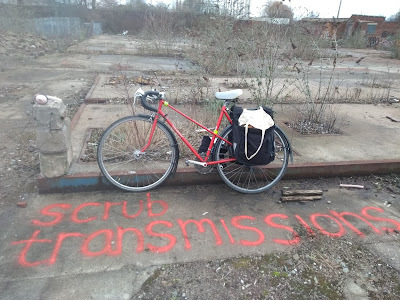 Valentina Orrù has recently completed a MA in Arts Management, Policy and Practice at the University of Manchester, researching urban regeneration and cultural planning. In love with Manchester and with a passion for cities, cultures and travelling, she loves discovering new worlds without forgetting her origins. Valentina is very pleased to contribute a traditional recipe from her Italian region of origin Sardinia, translated into the Sardinian dialect of her home village Mogoro, to this edition of the Shrieking Violet. Download and print your own copy as a PDF here. To request a free paper copy email your name and address to Natalie.rose.bradbury@googlemail.com. I have been asked to do a guest lecture about self-publishing and the Shrieking Violet blog/zine for undergraduate students on Manchester Metropolitan University's interdisciplinary Unit X in April. 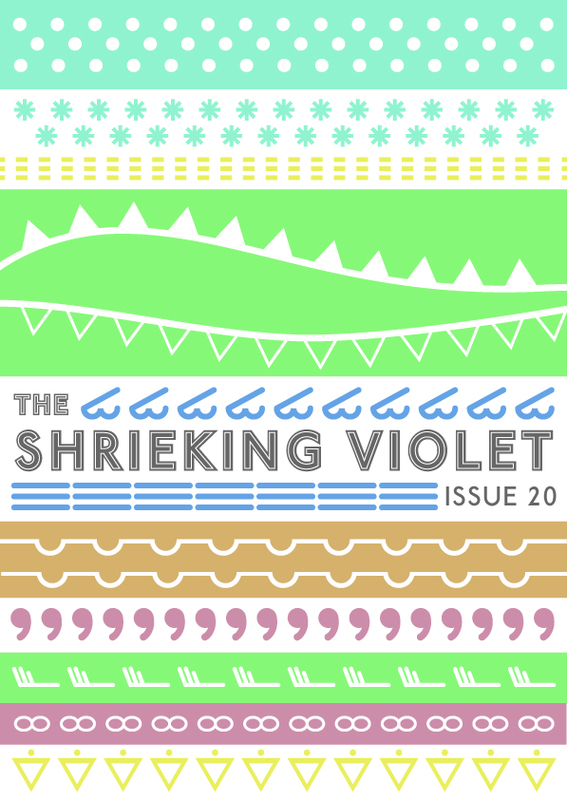 Read about issue 20 of the Shrieking Violet on Creative Tourist here. From the late seventeenth century up until his death in 1758, the Second Earl of Warrington amassed a large silverware collection at his country home in Dunham Massey in Cheshire, encompassing everyday household objects ranging from plates, cutlery, candlesticks, bread baskets and chamber pots to large water cisterns. More than 250 years later, Manchester artists' co-operative Ultimate Holding Company has used this precious collection – much of it sold off over the years but now being returned to its original home – as the starting point for a project to refashion these glittering, valuable objects, at once functional and decorative, in one of this century's most ubiquitous materials, common domestic tin foil. With only an hour to spend with the collection at Dunham Massey, some of UHC's works copy the design and decoration of the Earl's silverware, approximating the scale and complexity of items in the collection, whereas others are entirely new constructs inspired by the history of the time and the webs of stories woven by the industrial revolution, which formed the backdrop of the Earl's lifetime. The resulting exhibition Tin Town, currently on show in makeshift structures in the centre of the vast, underused, functionally ornate space of Campfield market hall just off Deansgate in Manchester, meditates on how we place value on materials and which objects we hold dear. UHC's tinware collection, moulded, engraved and held together with metal tape, is both beautiful and fragile, comprising lightweight yet fully formed replicas of the solid, heavy pieces which inspired it, made all the more impressive by the objects' underlying delicacy and transience. The product from which UHC's tinware is made, today commonly known as tin foil is, in fact, aluminium foil; tin was superseded in the mid-twentieth century both because aluminium is more flexible, and because tin slightly tinged the taste of food in kitchen use. Once a rare and expensive material, today aluminium is both readily available and highly sought after for recycling. Far from being disposable in the way we understand the word (ie, implying a lack of value), part of the value of aluminium comes from the fact that it can be recycled easily, and used again and again and again. Tin Town also refers to one of the lesser-acknowledged aspects of the industrial revolution, temporary, overcrowded settlements of navvies, the undersung (often immigrant) labourers who built the infrastructure of the industrial revolution, such as canals – including Britain's first canal, the Bridgewater Canal, designed as a way for the Duke of Bridgewater to transport coal to Manchester from his mine at Worsley (begun shortly after the Earl of Warrington's death, the Bridgewater Canal eventually extended out to Dunham Massey). Tin towns grew up alongside major building projects such as these, a fact acknowledged both by the show's title and presentation and by the painstaking engraving of a typical navvy settlement on one of UHC's decorative tin plates. Like the Earl's silverware, which over the years has gone from existing as objects of use to becoming ornaments in glass cases, the value and role of the canals which powered the industrial revolution has changed too – from places of industry, toil and commerce to quiet backwaters and pleasure spots, part of the repackaging of the sites of our industrial history as destinations of as much interest for daytrippers and historians as the elegant stately home or traditional country park. Tin Town is at Upper Campfield Market, Liverpool Road, Castlefield, Manchester, M3 4FH until Sunday February 24, open daily from 11am-7pm, and is free to visit. There are also a number of drop-in art workshops on Tuesday 19, Thursday 21 and Saturday 23 February from 1pm-3pm. For more information visit www.nationaltrust.org.uk/visit/local-to-you/north-west/things-to-see-and-do/article-1355767317799/?campid=tintown. I recently started a PhD, and during two weeks training in how to be a research student we had a session on time management (we were mainly told fairly obvious things like 'checking your Facebook page will not help you with your research'). One of the things we had to do during this session was to think of five things we could not live without. I decided that without food, sleep, fresh air and exercise (getting out for a walk every day, even if it's only just to the shops), and having time to spend by myself and having time to spend with other people with whom I have things in common, I would quickly get very miserable and find it hard to function. We were then asked to narrow our choices down to the two most important (food and sleep for me) and finally pick the one thing we really couldn't live without. Whilst I was trying to choose between food and sleep, it turned out everyone else was thinking about things like their family and their pets. However, I don't think it's possible to overstate the importance of food in my life, not just as sustenance but also as a way of experiencing experimentation, adventure, comfort and familiarity. I feel like thinking about what I am going to eat, where I am going to get the ingredients from, and how I am going to cook them, gives my days and weeks structure, as well as something to look forward to, and I hope that however busy I became I would still have time to cook for myself. As well as trying out new recipes, I also love making old favourites. Strangely enough, I had never made rice pudding until recently, but it is a great dish as it pretty much looks after itself – once you have put the ingredients in the oven you can just leave them for a couple of hours until it's ready. I'm not a big eater of desserts, so I tend to make it into a main meal, or eat it cold for breakfast. I've also started making sure I have a pomegranate around (they are fairly cheap on the fruit and vegetable stall on High Street in the Northern Quarter and, once deseeded, last in the fridge for several days) as their seeds can be added to any number of dishes, sweet and savoury (see also the Shrieking Violet porridge recipe below, and an aubergine, walnut, pomegranate seed and brown rice salad I invented recently). On one of the occasions I made rice pudding for a communal dinner lately, my friend Lauren Velvick commented that she would love to make rice pudding but didn't know where to buy pudding rice. It was her birthday last weekend, so I made her a 'rice pudding kit' based on the ingredients and recipe below. Pre-heat oven to 150 degrees celsius. Grease a large oven dish. Wash and drain rice and add to dish. Add sugar and milk and stir. Grate in a generous amount of nutmeg and add the bay leaf and cardamon pods. Cook for two hours until the rice has reached the desired consistency (I like mine quite runny). Remove from the oven, remove the bayleaf and cardamon pods (if wished), stir in the pomegranate seeds and serve. I never used to be a great porridge eater (it’s the stodgiest food I know of, but strangely, and contrary to popular myth that it will keep you full until lunchtime, I’m always ravenous again an hour or two after eating it), but I have found myself eating it a lot in the winter mornings as it’s relatively warm, quick and convenient. As a savoury aficionado, I’m also not a big fruit eater (perhaps because I’ve never been much of a snacks or desserts person) and fruity porridge is also my way of feeling like I’m doing my bit to keep my diet varied and vitamin-filled. My main complaint about porridge is that it’s often runny or bland (unlike rice pudding, which I prefer runny), but I get around that by cooking it until all the liquid is absorbed and making as much of a meal out of it as possible. Using up some leftover desiccated coconut and chopped nuts one day was inspired, if I say so myself, as it lends the porridge some crunchiness; further ammunition against the blandness! Heat milk/water in a large pan. Add chopped fruit and simmer for 5-10 minutes depending on how much time you’ve got and how soft you like your fruit. Once fruit has softened, stir in oats, adding more liquid if required. Stir in ginger and cinnamon and sprinkle liberally with coconut/nuts. Keep stirring until porridge has reached desired consistency (up to a couple of minutes). Remove from the heat, stir in pomegranate seeds and serve in a bowl with a teaspoon of golden syrup or honey.